How’s THIS for a super group: Deep Purple’s Ian Gillan, Black Sabbath’s Tony Iommi, Iron Maiden’s Nick McBrain, ex-Metallica bassist Jason Newsted, ex-Deep Purple keyboardist Jon Lord and HIM’s Linde Lindstrom! Well, um, nothing against Lindstrom but, wow, he feels a bit out of place doesn’t he? I think his connection is he’s either dating or married to Iommi’s daughter. 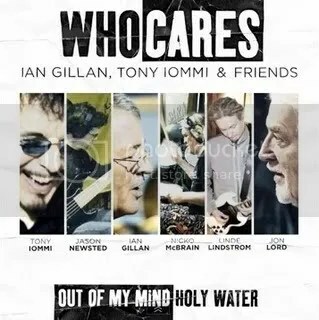 Who Cares was initially a project put together by Gillan & Iommi to help benefit the rebuilding of a music school in Armenia but there was always the vague promise that Gillan & Iommi would continue to work together on some new material. I imagine with a reunited Black Sabbath that won’t be happening… ever (Sabbath will probably take up the next few years and these guys are old enough already). Shame. I’d much rather hear a Iommi & Gillan record (Geezer can tag along too) than a new Sabbath album with Ozzy. Initially released as a digital single, the album has been made available on 7″ vinyl (limited to only 1,000 copies) and as a deluxe CD single featuring a video clip and a 30 minute documentary. Despite being a one-off super-group that implied Tony & Ian might continue to work together, Who Cares went a bit under the radar, I think. Yes, it was done for charity so it’s not like there was any huge label or promotion backing this but given the talent involved I would have expected more buzz from the rock/metal community. The songs are just phenomenal and while I haven’t heard any of Gillan’s recent work with Deep Purple, the guy can still sing and scream like a rock ‘n’ roll god (even if his voice is a tad bit weathered, but at 66 years old, I’ll give him a break). “Out of My Mind” is just plain heavy. Not Born Again heavy, but still heavy nonetheless, stomping along and sounding Black Sabbath & Deep Purple put in a blender: Iommi pulling out a great riff and solo, Gillan singing with venom and Jon Lord doing what he does best. Musically, it’s really not too far off from what we might’ve heard from Heaven & Hell. “Holy Water” is a bit more majestic in scope with a taste of the Middle East. I’m not all that well-versed on Deep Purple with Steve Morse but from what I have heard, this sounds like the type of song you might hear from them as Jon Lord’s keyboard factors heavily into this track and Gillan is a bit more subdued. Who Cares was put together for a great cause and features great music so it’s definitely worth buying. It also shows us what a great pairing Gillan & Iommi can still be and hopefully we can get some more music of out this duo in the future.